I discovered PanPastel® Colors for Models and Miniatures at Trainfest 2011 in Milwaukee. The company had recently discovered model railroading as an application for their product line. They were demonstrating how to weather model trains at their booth. The USA company makes professional grade artist's pastels colors in a unique pan (like make-up) format. The colors are packaged in round plastic containers that makes their use and storage a snap. There are special tools that you use to apply the colors. See the photo insets. I bought the Rust & Earth Weathering kit for light and dark rust, earth, mud and sand and filled in the set with a couple of grays. As you can see in the photo the range of colors is quite extensive. Colors can be layered to create an infinite color palette to get the look you want. 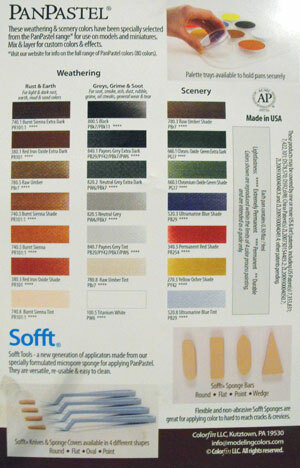 Their kits contain 7 colors, a palette tray and Sofft™ tools. Individual colors are available as well. Mix and then layer like paint. Quick and clean "no mess" compared to powders and chalk/pastel sticks. No drying or prep time. Erasable (before fixing with spray fixatives or other flat finishes). Ultra fine pigmented color formulations. The effects are very realistic and don't have that "painted on" appearance. No need to scrape or sand pastel sticks. You can literally achieve weathering effects in seconds. This weathering line is great for railroad models and structures, military models, action figures, and miniatures. My experience is that you don't have to use a fixative if the model is not going to be handled much. If your engines and rolling stock are used in operating sessions it's wise to fix the colors. You load the covers on the knives with a bit of color by gently swiping over the color surface in the tub/"pan" several times. A few light passes is all that's required. Digging into the color creates excessive dust and waste. Apply the color to the surface of the model and build up in layers to achieve the coverage you want. You can mix the colors to create customs colors, either in the "pan" or on the model. If the pan's surface becomes contaminated with colors, gently wipe the surface with a clean sponge or paper towel. The tool covers can also be cleaned in the same manner. The same tool can be used with muultipe colors. Simply "clean" by wiping on a dry paper towel. As I mentioned eariler, lock the color(s)with a fixative if the model will be handled frequently. Keep the pan's surface dry at all times. 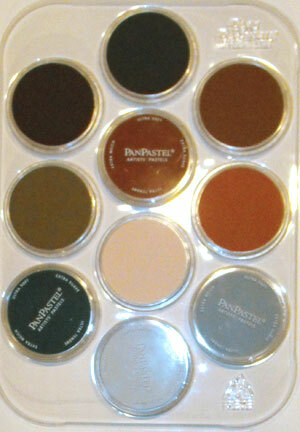 Never use wet tools, fluids or mediums with the color pan. The manufacturer advises mixing PanPastel® colors on a palette or directly on the model when combining with other mediums. Never do it in the pan/tub. If extra "grab" (adhesion) is wanted, apply a light coat of a clear flat finish. I recommend trying this weathering system. Sure beats pulling out the airbrush every time! More information at modelingcolors.com. Shop online from the largest selection of diecast model cars and die cast racing collectibles on the west coast.